A Falling Weight Deflectometer (FWD) / Heavy Weight Deflectometer (HWD) is a device capable of delivering dynamic loads to the pavement surface, similar in magnitude and duration to that of a single moving, heavy wheel load. The response of the pavement system is measured in terms of vertical deformation, or deflections, over a given area using deflection sensors. ERI currently maintains and operates five Falling Weight Deflectometers. ERI has integrated the GPR equipment with FWD/HWD. This provides the capability of acquiring real time thickness at every test point during deflection testing. 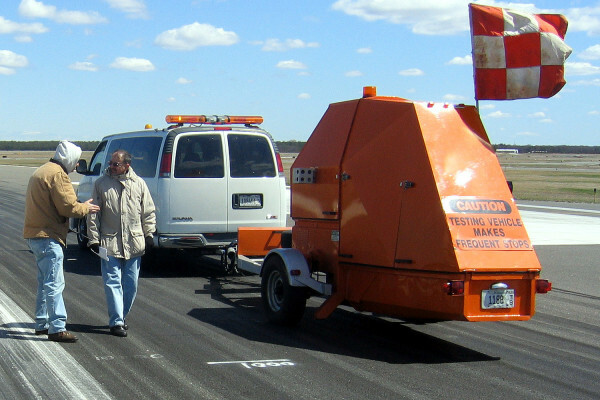 ERI has over 30 years of experience in testing a variety of pavement conditions and types including flexible, rigid, composite, unpaved, and rubblized surfaces. Our clients include airport authorities, state departments of transportation, cities, counties, universities, private agencies and research institutes. With a diverse background in pavement testing, design, evaluation, and management, ERI can conduct an efficient and economical FWD testing program customized to a client’s specific need.